1980: Doctor Who - The Rise And Fall Of Dudley Simpson | Warped Factor - Words in the Key of Geek. 1980 was a momentous year for Doctor Who - but within the secret sonic universe of Room 13 at BBC Television Centre, an equally seismic shift was taking place. With Tom Baker beginning to near the end of his seven years in the TARDIS, the man who had enjoyed a near ten year run as composer in residence would soon be given the order of the boot. "In recent years, Dudley Simpson had been writing the score for virtually every serial, which he then recorded with the help of a small number of musicians. Early in 1980, Nathan-Turner took Simpson out to dinner to inform him of the new status quo, bringing to an end the composer's fifteen-year association with Doctor Who." 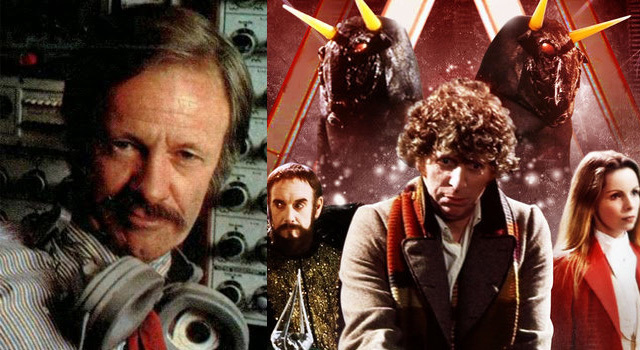 Simpson had been involved in the musical life of proceedings since a first incidental music credit for Planet Of Giants - his introduction to Doctor Who coming after his work on Moonstrike was noticed by director Mervyn Pinfield. "Moonstrike went on for about two years. God knows why, it was a terrible show. But my name was up on screen. I think that’s how I got my first ‘Doctor Who’. I was contacted by Mervyn Pinfield, who directed ‘Planet of the Giants’, the one where they went down the plughole. I remember they’d made a giant telephone which only just fitted into the studio, and a scene with some gigantic crazy paving." "...possesses that elusive knack of summing up the mood of a scene (whether it’s dramatic, comedic or poignant) so succinctly, without resorting to OTT orchestral or choral histrionics. A musical genius." Why, then, was he so unceremoniously shoved aside as the Eighties dawned? The move towards synthesiser-led scores was perhaps a budgetary decision as much as an aesthetic choice, as Matthew Sweet pointed out in his Why Doctor Who Is At The Cutting Edge Of British Music. "Doctor Who’s sculptors of sound were free to be as radical as they liked, as long as they didn’t spend too much." "Dudley Simpson, a former conductor for the Borovansky Ballet, employed water-gongs, car springs, a church organ and the first Moog synthesizer to create enormous soundscapes with a tiny band of session players: he became the programme’s longest-serving composer." His ascendancy had begun as Jon Pertwee replaced Patrick Troughton in the role of the Doctor. 1970's Spearhead From Space was the start of a run which would end with the aforementioned Horns Of Nimon - though work on four Hartnell and eight Troughtonian Era stories would prove quite the dress rehearsal. After his maiden score for Planet Of Giants he would handle The Crusade, The Chase and The Celestial Toymaker from the First Doctor's run. Following a first regeneration, Dudley would provide music for The Underwater Menace, The Macra Terror, The Evil Of The Daleks, The Ice Warriors, Fury From The Deep, The Seeds Of Death, The Space Pirates and The War Games. "Regular incidental music composer Dudley Simpson was informed that he had written his last score for the programme, and the BBC Radiophonic Workshop were commissioned to take on compositional duties full-time." Which led to Peter Howell being asked to rejig the theme tune in time for 1980's The Leisure Hive. And so he did, with the help of a Yamaha CS-80 synthesiser among others! Howell got the keyboard after what seems like a bit of grovelling, according to The Vinyl Factory. "Workshop technician Peter Howell was so desperate to get his hands on one of the expensive synths that he practically begged the BBC to shell out for one. Thankfully when they did, it featured on a large amount of Doctor Who’s ’80s soundtracks, and memorably was used to make the ring modulated sting sound that opened the theme music." "After 17 years of the original it came as a shock to hear something so radically different opening the series, but the fact that it was so different worked in its favour." "There's still this prevailing idea that we were somehow almost traitors for using modern gear and computers! Some people still believe that the original Workshop, with virtually no equipment, was the only incarnation that mattered. But we were there to do a job. With the Fairlight I could play something live, in real time; why on earth should I spent three weeks chopping up little bits of tape to get exactly the same result? We had to catch up with the real world — otherwise we'd never justify the time and cost." "Along came the synths and some rudimentary sequencers, which allowed me, Peter [Howell] and Roger [Limb] to run with the ball in a different direction. Yes, a lot of musicians were worried by the arrival of the synth, but as far as I was concerned, it allowed you to create sound quicker, and that was hugely important when you had two days to come up with a theme tune for a new science programme."